Thursday July 19th 1894 I went to town with apples this morning and was over home a little while. Mother does not feel well. I came home in time to get dinner and worked all afternoon doing baking. It was intensely hot. The boys were helping Uncle Jim thresh. Friday July 20th 1894 We had quite a nice rain last night. I did not go to town today. The Robinsons were out for a call this morning and Father & Mother were here all day. The boys cleaned out the cider press and made cider in the afternoon. They went to help thresh about four oclock and we did not have supper till very late. Saturday July 21st 1894 I went to town early this morning and took in apples. I was over the river a little while I did not go in with Will in the afternoon. it was three oclock when he started. After an early supper we went out to Charlie Hedges. It was ten oclock when we got home. 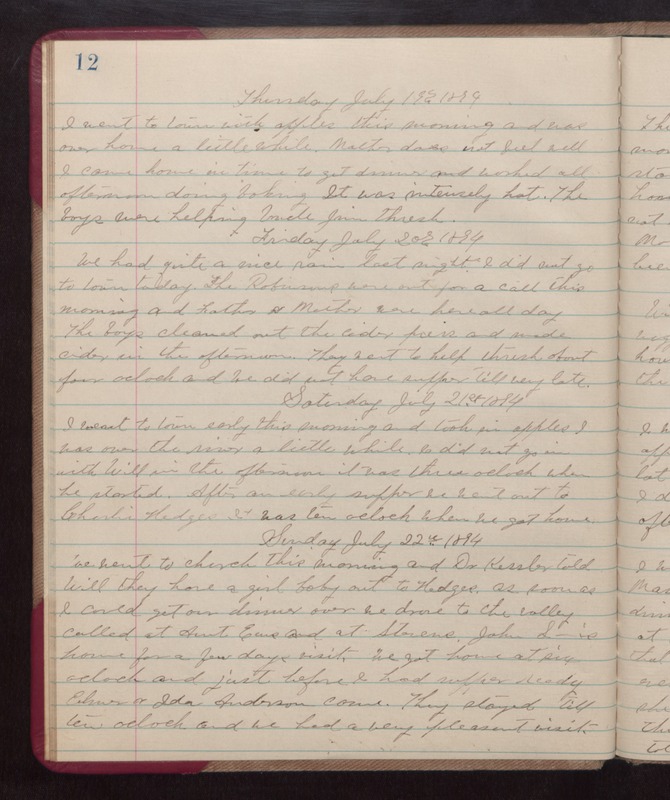 Sunday July 22nd 1894 We went to church this morning and Dr. Kessler told Will they have a girl baby out to Hedges as soon as I could get our dinner over we drove to the valley. Called at Aunt Ema anmd at Stevens. John S--- is home for a few days visit. We got home at six oclock and just before I had supper ready Elmer & Ida Anderson came. They stayed till ten oclock and we had a very pleasant visit.